With less than 24 hours notice a lively demonstration of around 30 people ensured Health Secretary Jeremy Hunt’s visit to Worthing Hospital did not pass without him experiencing the anger felt by NHS workers, patients and the public over the Tories’ plans to privatise the health service. Journalists from the local paper turned-up to cover the protest and to speak to the demonstrators. Unison, Unite, PCS and activists from Sussex Defend Our NHS were all represented on the demo. Representatives from the demo asked the hospital managers if Mr Hunt would receive a delegation of local Worthing residents in order to listen their concerns about privatisation, but were told Mr Hunt was too busy eating lunch to meet with them. Passing motorists beeped their horns in support. 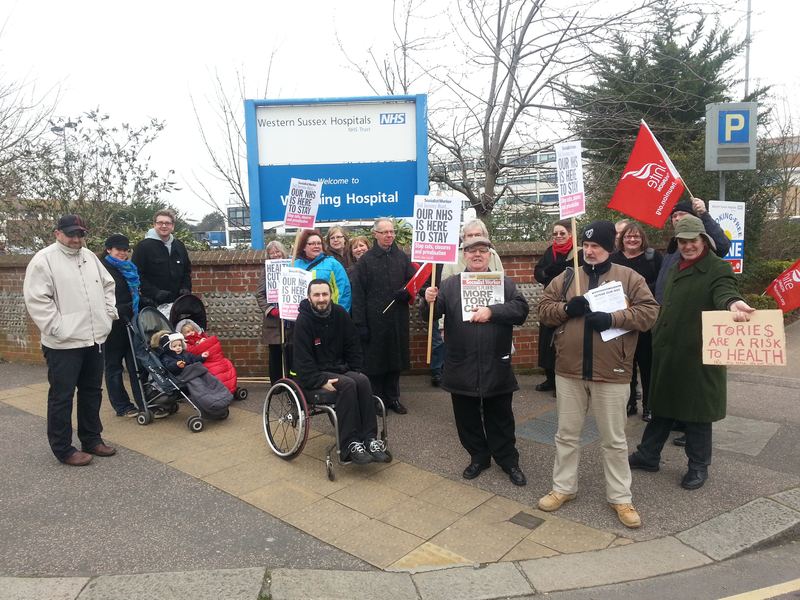 Local trade unionists and Worthing residents eagerly signed the Defend The NHS petition and were keen to hear news of the “reception committee” planned for Lewisham axe-man Matthew Kershaw on Saturday 6 April – when he takes over as Chief Executive of Brighton & Sussex University Hospitals Trust. Kershaw has already let staff at the hospitals know that he “could not rule out the possibility of redundancies as part of a raft of meaasures needed to make savings.” Sussex Defend The NHS are determined to make Mr. Kershaw re-evaluate his service delivery objectives.